Reality Check – So You Think Video Game Consoles Today Are Expensive? Posted on September 24, 2012 by Pat B. Are the consoles you buy today as expensive as the ones you bought 10 years ago? 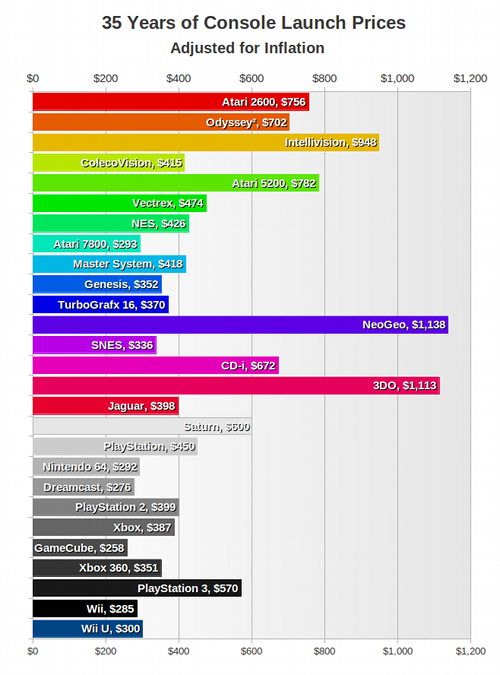 Last week Gamasutra posted an article comparing the price of the WiiU to the launch price of 26 other consoles going all the way back to Colecovision. This chart took things one step further though and adjusted the prices to reflect inflation over the years, the results are pretty shocking. Perhaps the most shocking is the price of the Neo Geo. This system was and still is pretty expensive. At launch, a Neo Geo Gold System ran gamers a cool $650. Today, a complete Neo Geo system, AES or CD, can still go for as much as $300. In fact, I recently purchased a Neo Geo Pocket Color with 9 games and it cost me $100, pretty stiff for a handheld released back in the mid 90’s but it was so worth it. 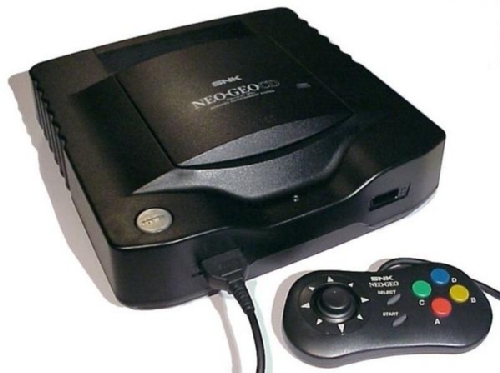 The Neo Geo CD, one of the greatest game consoles ever made. 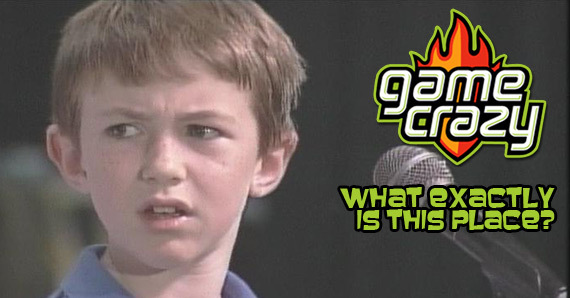 $700 for a 3DO? Sounds fair. Aside from the awesomeness that is the Neo Geo, the other interesting thing this chart shows is that when new hardware is introduced, the price of video games spikes. 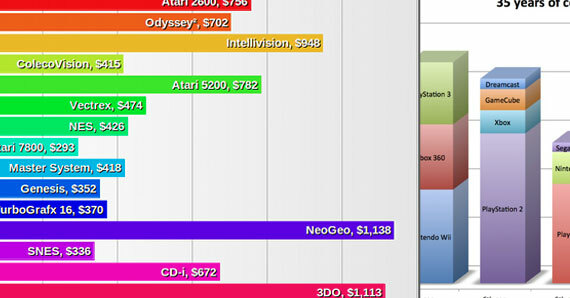 From the Atari 2600 all the way up to the Super Nintendo, console prices were pretty consistent. However, all of these systems were the classic plastic cartridge based consoles that we all know and love from our childhood. 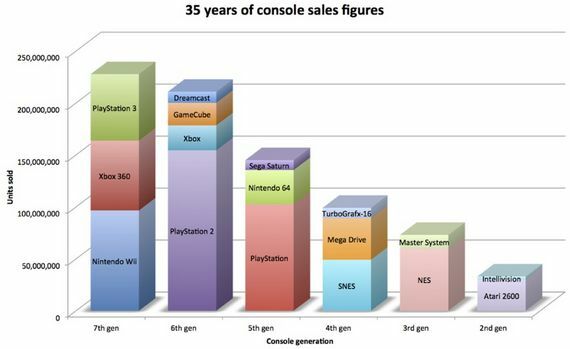 When compact disc technology started being used in game consoles, prices soared. We got systems like the CD-i and the Panasonic 3DO with launch prices starting at $400 and going up to $700. 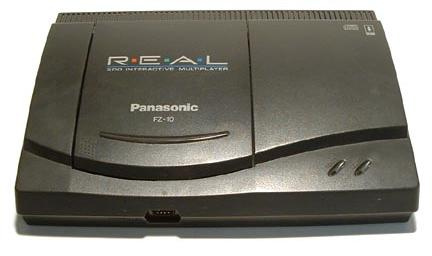 The Panasonic 3DO was marketed as a media system capable of playing video and not just video games. Have you heard of this Blu-ray thingy? 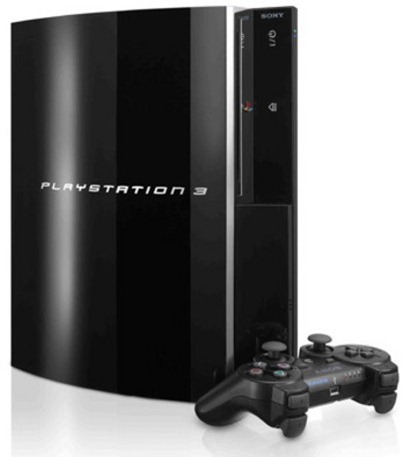 After the first CD based consoles were released, console prices eventually worked there way back down to reasonable levels, that is of course, until the Playstation 3 was released. The price of the PS3 topped out at $600 but this system had something no other game console had, a Blu-ray player. Now that prices of regular stand alone Blu-ray players have come down, so has the price of the PS3. 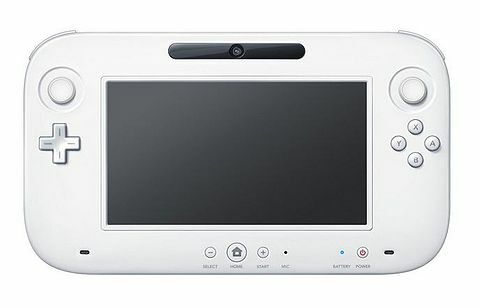 The WiiU – Something new? So how does the WiiU fit into all of this? Well, Nintendo is changing the game a bit with the new tablet controller but the technology that’s in the controller is old hat. Touchscreens and motion controls are something that have been around for a while now and even though the whole tablet thing is relatively new in video games, the technology has been in our hands for a few years. If the WiiU had been released before the first iPad or tablet then its launch price probably would have been similar to that of the 3DO when it was released. This is the nice thing about the WiiU and the upcoming next gen consoles, with the exception of better video and processing hardware, everything else in the systems will be established technology which will be cheaper to produce and include in game consoles. That’s good news for gamers. An Introduction To the NEW Game Crazy New Limited Edition Consoles from the Big Three! 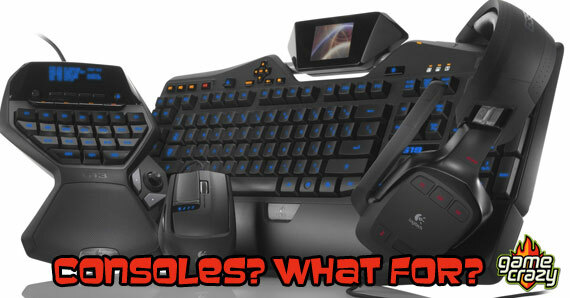 Do Gaming Consoles Have a Future? Android Micro-Consoles – In Google Play We Trust Are Tablets and Smartphones Replacing Mobile Game Consoles? Why Next-Gen Consoles Are Not Ready for “Always-On” Spin Control – How Game Makers Deal With Launch Failures and Service Outages Are Backwards Compatible Consoles a Thing of the Past? This entry was posted in The GC Blog and tagged console prices, future game consoles, neo geo cd, wii u by Pat B.. Bookmark the permalink.